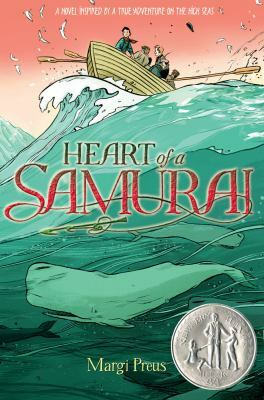 Posted on July 1, 2012 by ShannaPosted in Asian/Pacific American Award, Children's Lit, Historical, Newbery HonorTagged Historical Setting, Japan, Margi Preus, newbery medal, Samurai, whaling. ​I love Preus’s telling of the story. The book is very well, yet plainly written. and powerful, yet subtle. Most importantly, she does not dwell–she does not use ten pages to say something that can be done in one–which keeps the story interesting and inviting. That, and portions of the book–Chapter 24, especially–are ever so hilarious. And, ​I agree that this book certainly belongs in the classroom. So much can be learned from Preus and Manjiro about so many subjects. ​Thank you so much for the recommendation, Shanna. Thank you for reading and commenting, Chris! I loved Preus’s simple writing, too! I think that sometimes adults forget that children love to read for plot, and it isn’t until later that elaborate descriptions become interesting, but she definitely keeps things interesting. The Gold Rush, whaling, horse races-I love seeing this kind of historical fiction, especially with a young male protagonist!